The Business Boutique Conference is an event that’s focused on helping women who want to learn more about starting or growing their dream businesses. Christy Wright is the face and personality behind the brand, which is also part of Ramsey Solutions. She hosts the Business Boutique podcast and has also published a book. She’s a leader worth following. This conference was very special to me because I got to participate! 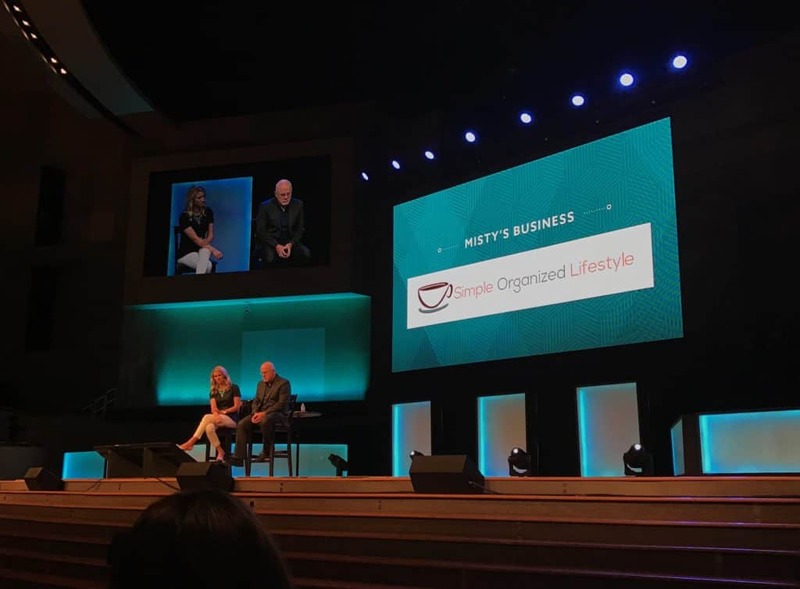 I submitted questions ahead of the conference and one of the questions was chosen to be answered during the Q&A part of the conference by Christy and Dave Ramsey. This photo was taken while I was asking my question! How awesome was that? Nerve wrecking! But still awesome! I’ll tell you what I asked and their responses in just a bit. First, here are some of the top takeaways I took from this conference. Sounds simple enough, but there’s really much more to consider than just finances and logistics. To really do well with your product or service, you have to know where you are going with it and make intentional decisions along the way to meet your goals. One of my favorite online entrepreneurs is Pat Flynn. He is mega-successful but I have no doubt that one of the reasons for that success is he is a great example of knowing your business inside and out. He’s clear about the vision, community and everything that makes his brand stand out. In other words, you’ve gotta know your business to grow your business! A sale is transactional, but most sales originate from a place where a relationship has been built first. There is so much scammy, spammy noise in the online space that someone who shows they care and value their customer is going to stand out and cut through the noise. This does not just apply to the online space, it’s true of brick and mortar as well. We have a popular small sandwich restaurant in our hometown. Over the years, the owner got to know my sandwich order and how much I loved their sweet tea. When I would walk through the door, he would greet me with a “Well, hey there girl!” every single time. He was one of the first to know I was pregnant after many years of trying, not because I told him, but because he noticed I was drinking water instead of tea. Sadly, Mr. J. was diagnosed with cancer and passed away just a few years ago. It was hard for me to return for awhile, but I’m back to being a frequent customer and a forever fan. Mr. J’s precious daughter now owns the business and it continues to grow from the seeds her dad planted in our community through the years. 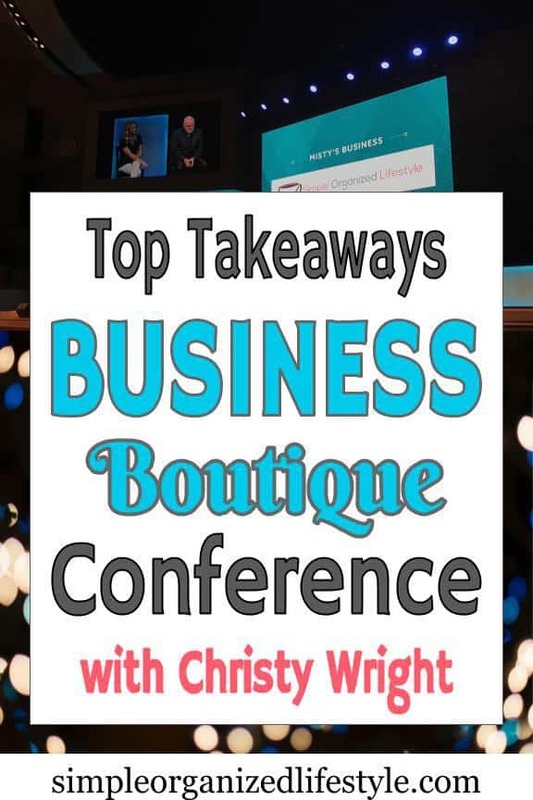 This presentation during Business Boutique was key financial principles for business owners. Basically, not spending your life savings or borrowing a ton of money to build a business that may not be profitable. My favorite quote from this part of the presentation was in reference to giving. “Being generous is the hallmark of people who live successful lives and who operate businesses with soul.” Agree! They could have also said it’s people with a growth mindset. Christy had recently been on a live news show. She told us they veered off from the original topic and it was like they were speaking another language. She was sitting on a tall chair and it felt like it was about to tip over. Basically, she was caught off guard and a bit terrified. She played the clip back for us and it was both funny and made us all have that “knot in the stomach” moment with her. But, she answered the question with a smile and achieved her mission. I mentioned above that this conference was special because I got to participate in the audience Q&A. The emcee (Annie Downs) stood beside me while my question was presented and Christy Wright & Dave Ramsey gave their answers. What’s one common mistake to avoid as an online entrepreneur? Christy Wright said to serve and take care of customers and (something along the lines of) not getting caught up in the minor details. Great advice from two people who are part of a business that continues to grow and help millions of people! To get to know Christy Wright and this community better, here are a couple of links to her podcast, academy and book. I’m a long time listener to the podcast- it’s fantastic! I have not joined her academy but I would imagine she stands behind her advice of serving and taking care of customers. I highly recommend this conference and would go again if it comes back to our state (GA). Besides the excellent content, it’s an event where you leave encouraged, inspired and ready to take your business to the next level!